Whether you’re a newcomer to the Vancouver Folk Music Festival, or you’ve been going for years, here are some handy tips to make the most of this weekend’s festival experience. 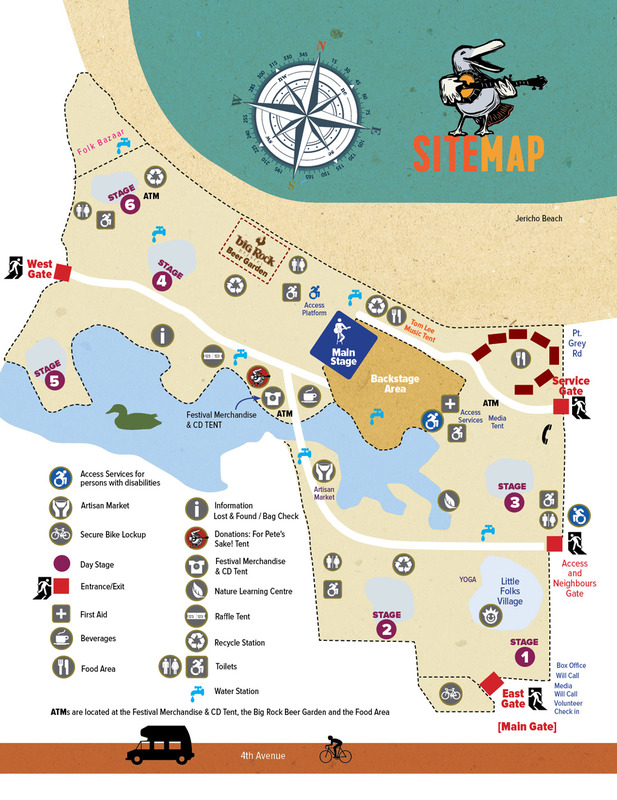 From information on kid-friendly zones, to access to drinking water, to site maps, we’ve got you covered. Friday: 1 to 10 p.m.
Saturday and Sunday: 9 a.m. to 10 p.m.
Saturday and Sunday: 9:30 a.m. to 10 p.m.
*Security is present at each gate should you require re-entry after 10:00pm. Location: Jericho Beach Park is located off West 4th Avenue, just west of Alma Street. Parking: Available parking is very difficult to find, so the VFMF encourages patrons to come to the Festival via public transit or by bike – or even on your own two feet! If you must travel by car, follow the signs along West 4th Avenue to Festival parking. 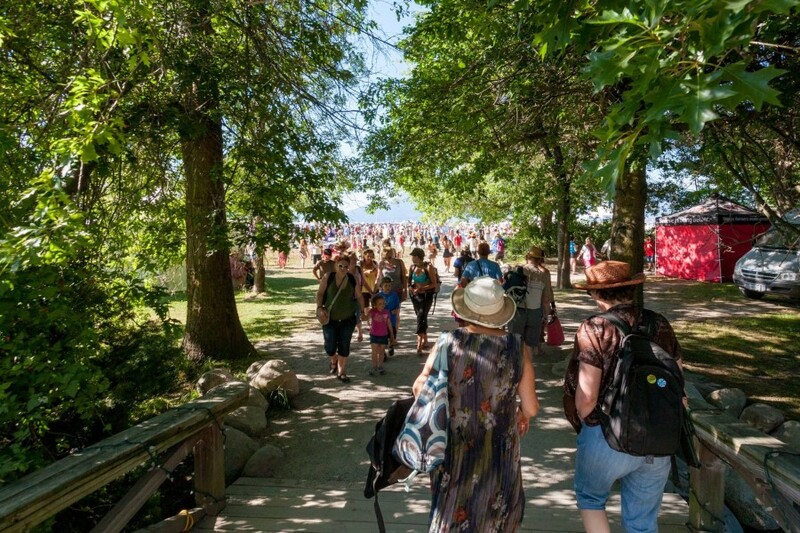 Public Transit: The #4 bus will take you directly to the site at Jericho Beach Park. Exit the bus on the 4000 Block stop, and walk to the Festival site from there. More information on the VFMF’s Getting Here page. Cycling: The VFMF provides bicycle parking in two supervised lots for only $2 per bike per day. Lots are located close to West 4th Avenue near the East Gate or the West Gate. Who is playing at the festival? The Full Festival Schedule includes all daytime workshops and concerts. The Evening Concerts includes mainstage shows running from 5 to 11 p.m. each night. What to bring to the festival? Seating: You should bring a blanket or tarp to lay on the ground. The maximum size of blankets and tarps allowed on-site is 10’x10′. Lawn chairs are permitted but the chair legs can be no taller than 4.5 inches. Clothing: The Festival happens rain or shine, so wear weather-appropriate clothing. This year, the forecast seems to be sunny and clear, but make sure to check back day-of and be prepared to pack hats and sunscreen. You should bring a warm sweater for the evening concert as the stage is near the water and can get chilly at night. Food: The VFMF’s Food Area has a great reputation for diverse and delicious food, and is a very special part of the Festival experience. Vegetarian, vegan, and gluten-free options also available. 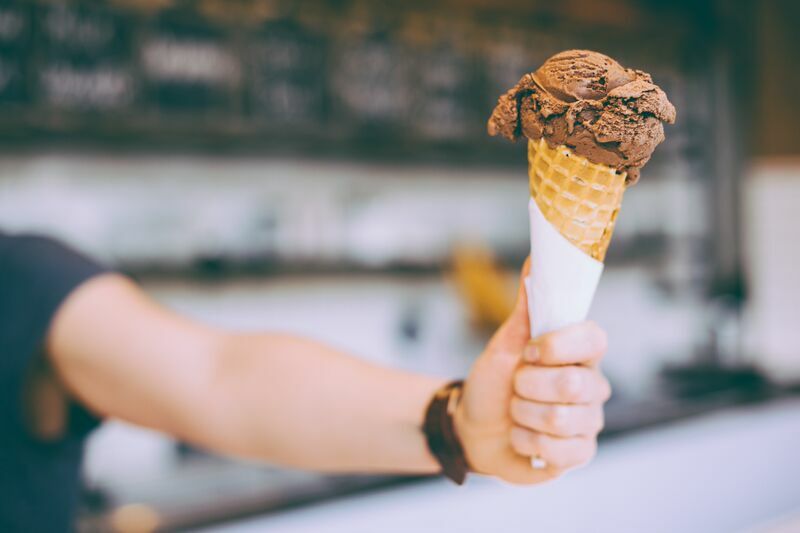 Feel free to bring your own food (there are recycling bins to help you minimize garbage), but no alcohol or other substances are permitted on the Festival grounds. Drinks: Bottled water is not available for purchase on-site; bring your own container for the filtered water at self-serve water stations courtesy of watermatters. The VFMF’s official beverage sponsor Big Rock Brewery is also on-site. Craft Markets: A highlight of the Festival, The Artisan Market will be back with lots of wonderful hand-crafted items for purchase. Don’t forget to drop by the Festival Booth for souvenir mugs, hats, and lawn chairs. There are also 160 vendors in the ever-popular Folk Bazaar along the beach. 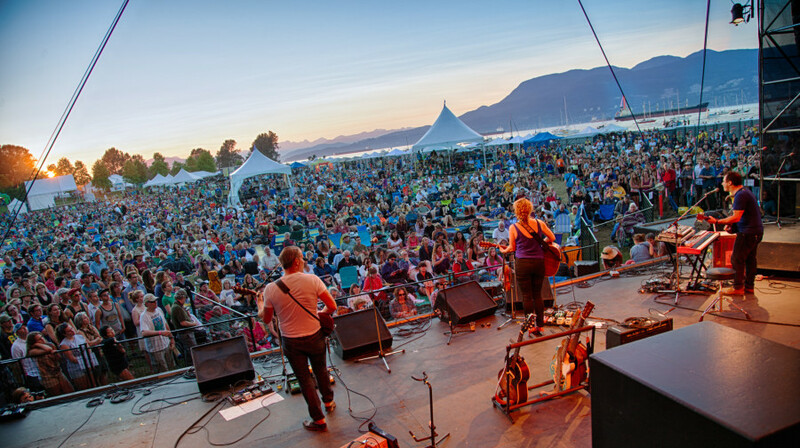 The Vancouver Folk Music Festival runs from July 17 to 19 at select venues around Vancouver. Full program and tickets at thefestival.bc.ca.